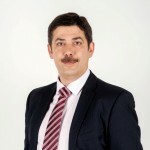 Algirdas Ruksenas has more than 25 years experience in sales and manufacturing management at business unit and company level. He was working for Eksma group companies as engineer, manufacturing manager and vice director for marketing and business development. His expertise covers several high tech B2B business areas: industrial and scientific lasers, manufacturing equipment based on advanced lasers, precision optical devices and components, electric, electronic, medical&laboratory equipment. Algirdas has strong skills in international business development, market and products development project execution, relationship management with Lithuanian and foreign clients and business partners. Algirdas Ruksenas was working as Chief Representative of Ekspla and EksmaOptics Representative Office in Shanghai, P.R. China from 2011 to 2014. The office made great achievements in marketing and sales of industrial lasers, equiment and optics used in electronics, automotive, aerospace, new energy and medical manufacturing industries in China. Algirdas has good understanding about local business and culture environment, wide network in related business and scientific areas. He is ready to assist with his expertise to Lithuanian companies who are willing to expand in China.